We sat in our jammies outside in the brilliant light early this morning--drinking coffee and making plans for the Christmas holidays. Los Angeles. Las Vegas? Both? Neither? Las Vegas has the Guggenheim? and gondola rides. Disneyland on it's ear...Worth seeing but maybe not over Christmas. We need to see it for the entertainment value and the sacred and profane aspects/ church and state..and how does it work? how do they bump up against each other? does it work? Who is there to participate in culture versus gambling? Or are the two hand in hand? Now is the time to plan, and if you have to buy tickets, the best prices for airfare is now. Hotels can wait. Cloudless with a breeze. We talked about seating for the porch, the farmer's market, opportunities for our littles. The cooking last night parlayed into breakfast and lunch--so we eased into the time without that hanging over us. R. art directed my slide show...suggesting different layouts, different approaches...which was helpful. I decided to take quotes from wonderful Wayne Thiebault and cut them into my slides of work (black background, white Requiem typography). Reading about Thiebault, looking at my books and thinking on the events of the last week within the context of breezes and water, quiet and amongst family was a balm and a context setter for me. I will keep working, trying and growing.. and my work is trying and growing. Not fixed...and the art, if it's there, it's there. There is nothing wrong with what I am doing, nothing wrong with working on my hand and craft, nothiing wrong with my imagery. I am not trying to be artful. I am making pictures that speak to me...some more than others.I did not enter into this enterprise to be set apart to be made defensive of the work and effort I have put in the last 24 months. The real work for the past year...exactly. Whitney Sherman tomorrow. Making the slide show has been good...and has prompted me to think about the idea that we should have shown our work in a powerpoint format day one of SU (or Hartford) to the student body to introduce ourselves broadly to the larger group. If it was too much..at least midway through as a levelset to our fellow students to share in your personal growth...and being able to fully understand it. I plan on adding to this slide show as it would be nice to show during the Ithaca Art Trail weekends as an introduction to the work. Terry Brown does the art/illustration history at 7-8:30 am, 12-1 pm and 4-6 pm. I think I will take the two later ones tomorrow and see how it goes. We floated in the lake in the perfect, and clear water. Shady Grove swam too...chasing pine cones willingly. The gulls are still frightened by the bobble headed owl and our scare eye. K was full of beans, jumping off the dock, paddling around with flippers and goggles. A happy, sweet dear girl. A. is off with his friend for lake time and dogs, music and basketball. His first big sleepover for more than one night. We know he is going to have a terrific time. Late now. Must go. Tomorrow is coming on quickly. 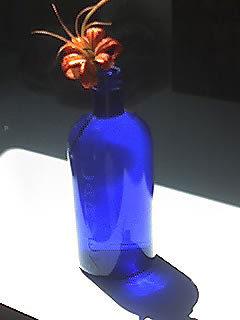 Tigerlily in a Larvex blue bottle in a pool of light in our kitchen.